Berlin, 8 January 2019 (IOM)* – For the fifth consecutive year more than 4,000 people are believed to have died or gone missing on migratory routes across the globe, the International Organization for Migration’s (IOM) Missing Migrants Project (MMP) reports. Half (2,297) of those people were among the more than 116,000 migrants known to have arrived in Europe via the Mediterranean. 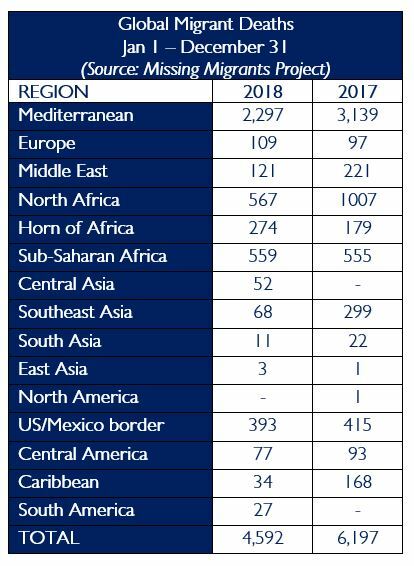 There are few reliable sources of information about deaths and disappearances due to the clandestine nature of irregular migration so the data collected in some regions, particularly the desert approaches to Mediterranean crossing routes, are incomplete.